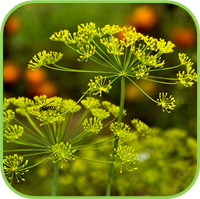 Dill has a single tap root and long hollow stalks that produce feathery blue green leaves that branch at the top to bear 15cm wide clusters of yellow flowers in summer. 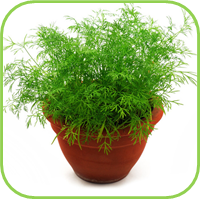 The leaves have a pronounced tang and along with the seeds are used in a variety of dishes. Annual. H:1m W:0.5m. 12cm, 17cm. •± 1m; Spread: ±60 cm. • Attracting Beneficial insects: The flowers attract many beneficial insects such as tiny wasps and flies that prey on aphids. • The fresh leaves deliver much more flavour than dried leaves. • Crush and infuse the seed as a nail strengthening bath. • Use in a salt-free diet as it is rich in mineral salts. • Eyes : Macular Degeneration - High in the Carotenoids, lutein and zeaxanthin, that is beneficial for MD. 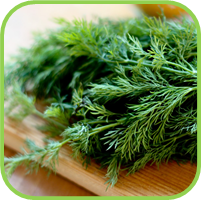 • Scientists found that dill inhibits the secretion of stomach acids in mice, and may help protect a raptured stomach lining from irritants. • Older children: Half a cup.